EcoGel is a revolutionary new product that makes disposable of waste a dream come true, especially during an emergency. Each EcoGel Stick (20 included) is a pain-free way to treat up to 1 gallon of waste at a time. Simply pour the EcoGel powder into your waste to solidify the moisture, allowing you to seal the toilet liner and easily dispose of it. Clean, simple, effective! Portable sanitation kits are especially useful to have during an emergency, especially if water and sewer services get shut down. EcoGel Powder is absolutely incredible new way to dispose of your waste and is the perfect addition to your emergency or camping supplies. Simply pour the EcoGel powder into your waste to solidify the moisture, seal the toilet liner and easily dispose of it. Click the following link if you are looking for the Complete Toilet Set with EcoGel from Legacy Food Storage, the ultimate sanitation solution for emergency preppers! 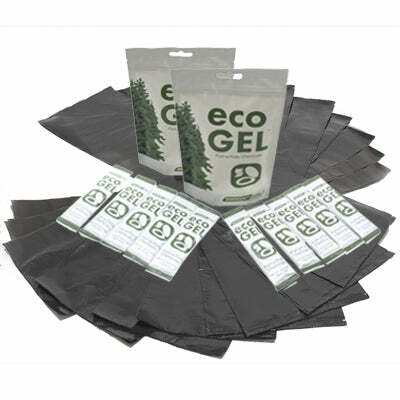 But if you just need to refill or buy additional EcoGel sticks, this sanitation pack provides 20 individual sticks and 10 liner bags to help you dispose of up to 20 gallons of waste.